Scoring the best deals requires as much advance planning and intelligence as a successful military campaign. Fortunately, shoppers have their own online tools to spy out their optimal Black Friday shopping strategy. “Leaked Black Friday ads” have become as traditional as cranberry sauce for the Thanksgiving holiday. Whether they’re really leaked by disgruntled employees of major retailers or quietly released on purpose is debatable. But the formerly super-secret ads that are months in the making now find their way to numerous websites weeks before Black Friday. Many retailers also buy ads on Black Friday “leak” sites. Brad’s Black Friday http://blackfriday.bradsdeals.com is brought to us by Brad Wilson, who started helping his fellow college students find cheaper textbooks online way back in 2001. Brad’s Deals http://bradsdeals.com soon became the go-to source for bargains, discount programs, and coupons of all kinds. The Black Friday site was created in 2009. In addition to PDF scans of Black Friday ads, bargains are organized by categories such as clothing, TVs, laptops, etc. A directory of stores and their Black Friday hours helps consumers plan their campaigns. Deal News’ Black Friday http://dealnews.com/black-friday/ is a bit less busy and more structured than Brad’s site. BlackFriday.com http://blackfriday.com was founded in 2006 and has 1.5 million Facebook fans; not bad for a one-day wonder. BFads.net http://bfads.net lists the number of items in each batch of leaked ads it posts. Slick Deal’s Black Friday http://slickdeals.net/blackfriday/ includes discussion boards where users can trade local bargains and compare shopping experiences. 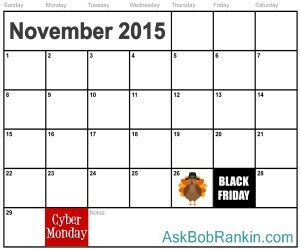 In fact, Black Friday has expanded to include the entire week of Thanksgiving and the following Monday. Retailers, in their anxiety to get into shoppers’ wallets before they’re emptied, increasingly run preemptive specials in the days leading up to Black Friday. These last-minute early-shopper specials are also covered by the Black Friday sites. Most Black Friday sites offer breaking-news alerts via email and mobile apps. “Cyber Monday” joined the shopping lexicon in 2005, when online retailers began reporting big spikes in their sales the Monday following Black Friday. Consumers who missed or skipped the Black Friday in-store carnage, or who were shut out on specifically wanted items, turned to the Web. Now Cyber Monday is a tradition as well-organized and marketed as Black Friday. All Black Friday sites also cover Cyber Monday in one way or another. Commerce on Thanksgiving Day itself remains controversial. Many Black Friday sites host lists of stores that will remain closed on T-day, and many consumers opt to patronize retailers who give their employees the holiday off. Others will appreciate the lists of T-day store opening times. Black Friday still draws enormous crowds to brick-and-mortar stores; there are even some morbid “death count” sites that keep track of how many shoppers and employees get trampled in the frenzy each year. But more and more consumers are opting out of the in-store insanity to do their heavy shopping online, in comfort and safety. Walmart.com is recognizing this trend by putting 97% of its Black Friday deals online, effective at 3:00 a. m. Eastern Time on Thanksgiving Day. Most recent comments on "The Best Black Friday Deals"
Never heard of bradsdeals or dealnews before. Thank you so much for the links. I don't do Black Friday insanity but I do try get my gift shopping done throughout the year. I love shopping on cyber Monday. Picked up some great deals in the past. What people need to do is find what they want or need first. Collect all the information about the product, but especially the price. Come Cyber Monday, you have already collected information about the item, including the price and start shopping. I did Black Friday once and that was enough, for me!!! I would rather do my shopping online, thank you very much. I have learned to go to Walmart, shop online, then have it sent to the nearest store, where 3 of my grandkids live, in California. My daughter can wrap them or not. Most of the time, they know what they are getting. Learned years ago, when kids reach a certain age, ask them what they want. Saves time and money or returns. @Carol -- Smart wisdom and a good reminder.